Members of the Fargo-Moorhead roller derby team say that one of their favorite parts of a bout is the physical contact with the other team. Submitted photo. It is roller derby season, and this year marks the fifth season that the Fargo-Moorhead derby girls have been competing. Brown hall director Laura Zeiher, also known as Larazzor, became interested in joining the F-M roller derby league after attending a bout. Stephanie Bondhus, also known on the rink as Boltaction, discovered roller derby while she was on a date. Before becoming part of the league, interested members must partake in a three-month course to understand the game. The roller derby rulebook is very large. According to Zeiher, each bout round is two minutes long and each bout lasts an hour. Each team has two jammers whose goal is to try to fully lap the other jammer. Each jammer is protected by their teammates referred to as the pivots. The goal of the pivot is not only to protect the jammer, but also to knock opponents down. In order to knock an opponent down, pivots must use their own body weight to cause their opponents to fall. 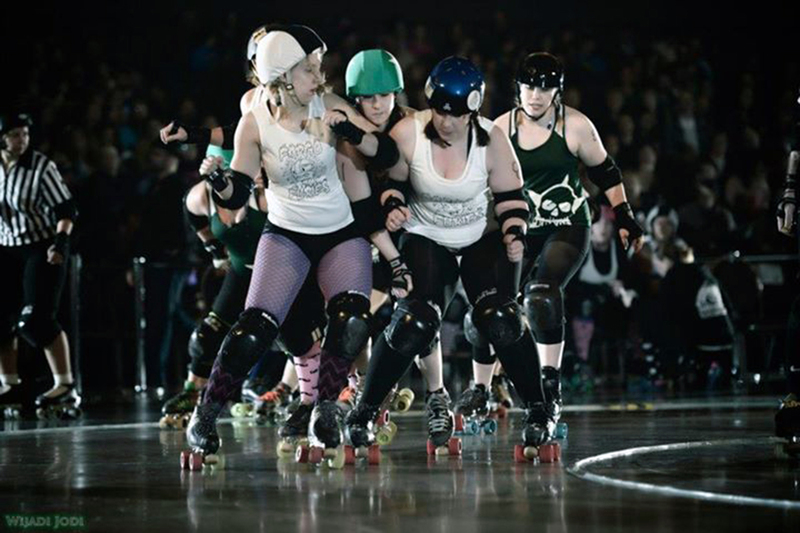 Unlike most sports, roller derby is one of the few contact sports women take part in. One of Zeiher’s favorite parts about being involved in roller derby is that she is able to break the stereotypical female sportsmanship roll. Bondhus played several sports while growing up, including hockey and lacrosse. However, she is prone to derby not only because it is a sport specifically for women, but also because the rules are always changing. One of the unique aspects of roller derby is that each participant comes up with their own derby name. With a little help from her boyfriend, Bondhus decided she wanted to represent one of her favorite weather patterns. Erica Raguse wanted to incorporate her actual name into her derby name. “I wanted my real name in it, so I decided on am-Erica the Brutiful,” Raguse said. Like most sporting events, derby spectators are required to pay an entree fee. Normally the money paid to attend a sporting event is used to pay for the team’s equipment, transportation services or other necessities. It is the opposite case, however, for roller derby. According to Zeiher, the entrance fee spectators pay is given to charity. Most teams celebrate after a big win. However, according to Zeiher the celebration after a roller derby bout is very different. You may not think that roller derby is for you. However, attending one of the many bouts this season may change your mind. Whether you attend the bouts to observe the sport or to try something new, Raguse hopes that even if you are unsure about your derby ability you come out and see for yourself.